Unofficial results of the Jakarta gubernatorial election last week show that embattled incumbent Basuki Tjahaja Purnama (popularly known as Ahok) has won with 43 per cent of the votes. However, since Mr Purnama and his running mate Djarot Saiful Hidayat failed to secure the 50 per cent threshold needed for an outright victory, the election will go to a run-off scheduled for April 19. They will go head to head against former education minister Anies Baswedan and running mate Sandiaga Uno, who came a close second with 40 per cent of the votes. Former president Susilo Bambang Yudhoyono’s son Agus Yudhoyono and running mate Sylviana Murni are out of the second-round race after coming last with less than 18 per cent of the votes. The first-round election result came after months of controversy and civil unrest following allegations of blasphemy against Mr Purnama for allegedly insulting the Quran. The case centred on an edited video showing him telling a small crowd in Jakarta’s Thousand Islands Regency not to be “fooled” by those who use Al Maidah verse 51 of the Quran to convince Muslims that it is a sin to vote for a non-Muslim leader. Mr Purnama, a Christian of Chinese descent, has pleaded his innocence and apologised. But the ongoing blasphemy trial has clearly hurt his campaign. Before the blasphemy allegations, Mr Purnama’s electability rating was at over 50 per cent, indicating that a first-round victory was not only possible, but likely. His opponent Mr Baswedan was a known political figure, but he was a newcomer to Jakarta politics, and many voters distrusted him for quickly switching political camps to Prabowo Subianto’s coalition after he was sacked from the Education Ministry in President Joko Widodo’s last Cabinet reshuffle. Similarly, Mr Agus Yudhoyono was a completely new political figure and largely seen as a puppet for his ambitious father’s political manoeuvres. While Mr Purnama’s ethnicity and religion had always brought about protests from radical Muslim groups such as the Islamic Defenders’ Front (FPI), the straight-talking and brash governor consistently achieved more than 70 per cent in performance satisfaction ratings with programmes such as the Jakarta MRT project and swift slum evictions around the city’s clogged-up river banks. Furthermore, with President Widodo’s PDI-P party behind him (in coalition with Golkar, National Democrat and Hanura parties), Mr Purnama had the strongest party mechanism support, not to mention the many people in Jakarta who supported him through grassroots channels. This was why Mr Purnama’s Al-Maidah comment was a gift for the Islamist factions and for his political opponents, as well as those of his close ally Mr Widodo. Mr Purnama’s electability ratings plummeted to almost 20 per cent at their worst in early November 2016. The blasphemy issue divided Jakarta, and race and religion dominated public discourse during the election campaign. Suddenly, a vote for Mr Purnama was a vote against Islam, and the far-right Islamist factions were quick to garner anti-Ahok sentiments. Because of this case, previously marginal radical Muslim vigilante groups such as the FPI became political players to be reckoned with. Indonesian police chief Tito Karnavian and Coordinating Minister for Political, Legal and Security Affairs Wiranto had to meet FPI leader Rizieq Shihab to urge calm following the successful mass mobilisation of anti-Ahok Muslim protesters. While his opponents never directly condemned Mr Purnama for blasphemy, they certainly benefited from the Islamist sentiments. Throughout the campaign, both Mr Baswedan and Mr Yudhoyono emphasised their Muslim identities and made shows of Islamic piety to appeal to Muslim voters. Mr Baswedan even went as far as meeting the FPI in a move that shocked those who had seen him as a moderate Muslim politician. Furthermore, rising anti-Chinese sentiments alleging various Chinese economic and political conspiracies behind Mr Purnama and the President have created legitimate worries among Chinese Indonesians traumatised by past anti-Chinese attacks during times of political instability. Evidently, the strategy of stirring up race and religious issues had worked. Despite having a high performance satisfaction rating as governor, Mr Purnama did not win outright and the battle will go into a second and final round. This was a huge blow for his camp as an Ahok victory in the second round will be even more difficult. So, what can we expect next? Now that there is more at stake with just two contenders, the political gloves are off and we can expect amplified religious and racial campaigning in the second round. The on-going blasphemy trial will continue to put the case in the spotlight and cast doubts about Mr Purnama’s future. The question now is whom Mr Yudhoyono’s supporters will back in the second round. Assuming that the majority of Mr Yudhoyono’s 18 per cent of votes came from Muslim voters who had refused to vote for Mr Purnama, the majority will presumably go towards Mr Baswedan as the other Muslim candidate. However, it is also not all doom and gloom for Mr Purnama. The very fact that he was able to bounce back and secure a first-round election victory despite the blasphemy case and concerted political attacks show that many in Muslim-majority Jakarta were able to see past race and religious issues in their voting decision. The second round of the election will be a test of just how mature and open-minded Jakarta voters really are. Mr Purnama and his campaign team must convince moderate Muslim swing voters to focus on his policy achievements and to stand together against the demands of hardline Islamists. Looking further afield, the political rhetoric, power play and result of the Jakarta gubernatorial election will have major implications for the 2019 presidential polls. An Ahok defeat will be a major blow for Mr Widodo and his PDI-P party, as not having Mr Purnama as an ally at the leadership of the capital city would weaken the president’s hold on power. More importantly, it would show that his opponents’ strategy of using race and religious issues as a political tool to destabilise and delegitimise Mr Widodo’s government has worked. This would in turn set a dangerous precedent in the lead-up to the 2019 presidential election and for the future of Indonesian plural society more generally. On Tuesday 12 December 2016 the blasphemy trial against incumbent Jakarta Governor Basuki Tjahaja Purnama (Ahok) officially began in the North Jakarta District Court. Since video footage of Ahok supposedly insulting Islam went viral on social media there has been a groundswell of anti-Ahok hate speech. This has been further inflamed by his ‘double minority’ status due to his Chinese ethnicity and Christian faith. On 11 October the Indonesian Ulema Council (MUI) formally issued a fatwa demanding that the authorities charge and prosecute Ahok for insulting the Quran. The fatwa also urged for calm during the judicial process but this request has largely fallen on deaf ears, particularly among small hard-line Islamist groups such as the Islamic Defenders Front and Hizbut Tahrir Indonesia. These two groups formed an Islamist coalition called the National Movement to Guard the MUI Fatwa (GNPF-MUI) and went on an aggressive anti-Ahok media campaign. On 4 November about 150,000 Muslims protested in the streets of Jakarta, pressing for Ahok to step down and be charged under blasphemy laws. The protest, organised by GNPF-MUI, turned violent after President Joko Widodo (Jokowi) refused to personally meet the protesters. The scale of this demonstration made it clear that Jokowi could no longer dismiss the gravity of the issue and the changing political climate it presages. Jokowi then met with influential Muslim leaders and politicians and openly accused ‘political actors’ of masterminding the public unrest. But even Ahok ally Jokowi could no longer afford to be on Ahok’s side, even if he personally believes that Ahok is innocent. The government quickly asked for the investigation to be expedited to prevent further unrest. Police officially charged Ahok for blasphemy on 17 November and completed the investigation within a week. The prosecution team took only three days to declare the case ready for trial, and announced on 1 December that the trial was to be fast-tracked for later in the month. Even with the unusual and worrying haste in which the case has been processed, Islamist groups continued with their anti-Ahok narrative as a rallying point for even bigger protests. On 2 December another anti-blasphemy demonstration took place in central Jakarta. It attracted at least twice the size of the 4 November demonstration, with estimates ranging from 500,000 to 750,000, making it possibly the largest single religious gathering in Indonesian history. Large numbers came from outside Jakarta, including many from outside Java. The 2 December protest was peaceful in that, unlike the previous one, the event concluded calmly in the early afternoon after mass Friday prayers. But some of the speeches given by the leaders of the protest such as the Islamic Defenders Front head Habib Rizieq Shihab were filled with messages of hate, intolerance (including calling Ahok a ‘kafir’ or ‘infidel’) and defiance of due judicial processes. Jokowi’s brief appearance on the main protest stage to pledge a fair trial and appease the mob only added legitimacy to the Islamist groups’ agenda. Jokowi’s reaction revealed just how dangerous this issue has become, and how successful hard-line Islamist groups and political opponents have been in utilising Ahok’s case to rile up angry mobs and increase their sphere of political influence. Now what will undoubtedly be a controversial and closely-watched trial has begun. Ahok’s defence team has already pointed out procedural errors in the investigation, including that the Letter of Order for Investigation required prior to the naming of a criminal suspect was never issued. But the court denied the defence’s motion to dismiss, even with evidence of procedural errors. Considering the enormous public and political pressure it is also unlikely that Ahok will be found not guilty, regardless of the evidence. The most likely scenario is that Ahok will eventually be found guilty and go to jail for a shorter amount of time than the maximum sentence for blasphemy of five years. Ahok would become a political martyr to his supporters as well as to Indonesia’s minorities and progressives. Ahok could then stage a political comeback on this platform in the future. But this blasphemy case has in many ways become far greater than Ahok. The complex saga has revealed the true depth of rifts that exist in Indonesian society between religions, classes, and those on opposite ends of the ideological spectrum — specifically among progressive and conservative Muslims. Whether or not Ahok is found guilty, this case has set a dangerous precedent that the blasphemy law could be used to bring down non-Muslim politicians or public figures. It is also a huge blow for pluralism, civil society and human rights in Indonesia. For a country that has claimed to be a tolerant and moderate Muslim-majority democracy, the Ahok blasphemy allegation signals a regression in religious freedom and the rights of minorities. The end for the incumbent Governor? Last week, the Indonesian National Police named incumbent Jakarta Governor Basuki Tjahaja Purnama (affectionately known as Ahok) as a blasphemy suspect. This means that Mr Purnama — an ethnic-Chinese Christian — will stand trial for allegedly uttering remarks some Muslims consider offensive. If found guilty, Mr Purnama could be sentenced to jail of up to five years. During his re-election campaign in Jakarta’s Thousand Islands Regency, Mr Purnama had urged a small crowd not to be deceived by those calling all Muslims not to vote for a non-Muslim leader because it is a sin. Referring to the use of Quranic verses such as Al Ma’idah verse 51 that prevents Muslims from electing a non-Muslim as leader, Mr Purnama said that voters should follow their guts when voting. Mr Purnama’s words were taken out of context, but have been seized by some groups to whip up public anger. On Nov 4, about 150,000 Muslims protested in the streets of Jakarta, pressing the Governor to step down and be charged under blasphemy laws. The protest, organised by hard-line Islamic vigilante groups such as the Islamic Defenders Front (FPI), began peacefully, but turned violent by the evening. President Joko Widodo has asked the police to investigate the case and pledged not to interfere. As it is, Mr Purnama’s candidacy for the 2017 Jakarta Gubernatorial election will continue despite being named as a blasphemy suspect. Mr Purnama is not required to withdraw from the race because Article 163 of Law Number 10/2016 governing the election of Governors, Regents and Mayors stipulates that candidates under legal investigation are still allowed to continue their candidacy and campaign activities. Mr Purnama can also assume the Governor post if elected, even if he remains under investigation. He would be required to withdraw his candidacy or be dismissed from his post as Governor only if he is found guilty. On average, criminal prosecution for high-profile cases of this nature takes at least seven months to reach a conclusion in Indonesia. Going by this average, the case is likely to be under investigation throughout the campaign season, and even beyond the Feb 15 election date. If Mr Purnama wins the election in the first round, by securing 50 per cent of popular votes ahead of his two rivals, he could potentially be Governor-elect by early March while the case is still under way. The situation will be more complicated if Mr Purnama does not win in the first round, and he has to contest in the second round, scheduled in April. Recent polls indicate that Mr Purnama remains the most popular candidate, but there is a possibility that he may lose the election if it drags into the second round. Thus, it is crucial for his campaign team to focus its efforts on getting him elected in the first round. By becoming Governor-elect, Mr Purnama can claim that he has the people’s mandate, which includes support from the Muslim majority residing in Jakarta. If he is found guilty of blasphemy and goes to jail after being elected, the election victory would also give him a much stronger platform for a political comeback in the future. The important question here is whether Jakarta’s Muslims would vote for a non-Muslim candidate who is a blasphemy suspect. While many ordinary Muslims have openly voiced their continuing support for Mr Purnama, observers are generally pessimistic over whether more-conservative Muslims would vote for him given the current circumstances. His opponents, Mr Anies Baswedan and Mr Agus Yudhoyono, are unlikely to engage in an open attack on Mr Purnama on the grounds of the blasphemy allegation. Their calculation is this: Enough damage has already been done to Mr Purnama’s reputation, and they do not want to be seen as playing the racial and religious cards, something that could alienate liberal and progressive voters. Yet, they will definitely capitalise on any lapses in Mr Purnama’s campaign. Both Mr Baswedan and Mr Yudhoyono have already targeted poorer Muslim areas that in recent weeks have rejected Mr Purnama’s campaign visits. Mr Purnama himself is retreating to his loyal supporter base, centred on his campaign headquarters, which also serves as a community help centre nicknamed ‘‘Rumah Lembang’’ (Lembang House), due to its location on Lembang Street in Central Jakarta. Moving forward, Mr Purnama will need to win the support of undecided and moderate Muslims, and so far he has made the right moves. He has apologised to Muslims offended by his remarks. He could also build on efforts made by President Joko Widodo in engaging moderate and even conservative Muslim leaders. After all, Mr Purnama continues to have close ties with the President. He was Mr Widodo’s running mate in the 2012 Jakarta elections, and for this coming election, he has been endorsed by the President’s party, PDI-P.
A few days before the Nov 4 protest, Mr Widodo met key religious leaders from the Ulama Council of Indonesia, Nahdlatul Ulama and Muhammadiyah to seek their cooperation in spreading a message of calm and non-violence. Some leaders from major Islamic organisations have openly already accepted Mr Purnama’s apology. To be sure, Muslims are also divided on this issue, but Mr Purnama needs to do more to win his critics over to his camp. Winning over undecided and moderate Muslim voters is vital for Mr Purnama’s survival as a politician. A strong showing by him in the polls would mean that both Muslims and non-Muslim Jakartans are able to see past the blasphemy allegations and focus on his track record and campaign promises. On the flipside, a heavy defeat would add legitimacy to the blasphemy case, which could then set a dangerous precedent for Indonesia. While this is not the first blasphemy allegation to go on trial in the country, it is the first involving a high-profile individual. Depending on the outcome of the elections, this could send an intimidating message that a blasphemy charge could potentially be used as a political tool to dismantle a non-Muslim candidate. The months ahead will be trying times for Mr Purnama and his campaign team. From a broader perspective, how the Jakarta Gubernatorial election unfolds will serve as a barometer to gauge just how mature and tolerant contemporary Indonesian voters really are. Like so many conflicts before it, this one started with a seemingly innocuous comment. On 26 September 2016, incumbent Jakarta Governor Basuki Tjahaja Purnama (Ahok) told a small crowd in Jakarta’s Thousand Islands Regency not to be ‘fooled’ by those who say that it would be a sin for a Muslim to vote for a non-Muslim leader. Referring specifically to verse 51 Al-Maidah of The Quran, Ahok said that voters should follow their guts when voting and not be influenced by religious provocation. This comment may have gone unnoticed if someone else in different political circumstances had said it. However, Ahok is an ethnic Chinese and a Christian, the first ‘double minority’ to be elected to Jakarta’s top office. Ahok has a sharp tongue and is known for his tough city management policies, such as the swift evictions in Jakarta’s slum areas. Ahok is also currently running for Governor in Jakarta’s upcoming provincial elections to be held on 15 February 2017. Rather than attacking his policies, Ahok’s political opponents have frequently attacked his ethnicity and religion. When video footage of Ahok’s Al-Maidah comment went viral on social media, his opponents got the loaded gun they have been waiting for. What resulted was one of the biggest mass demonstrations in Indonesia’s recent memory where, after Friday midday prayers on 4 November 2016, approximately 150,000 Muslims took to the main streets of downtown Jakarta to demand for Ahok’s prosecution for blasphemy against Islam. Jakarta is used to almost daily demonstrations, but for weeks in the lead up to this one, the city was gripped with uncharacteristic fear, not least because the rhetoric surrounding the demonstration became increasingly racist and violent in tone. Banners inciting anti-Chinese violence popped up around the city, invoking painful memories of the May 1998 riots, particularly for the city’s ethnic Chinese population. Organised by the Islamic vigilante organisation the Islamic Defenders Front (FPI), together with a number of other hard-line Islamist groups, what began as a relatively peaceful demonstration quickly turned violent when protesters refused to disperse following news that President Joko Widodo (Jokowi) had declined to meet them. Neither Ahok’s public apology, message of calm from moderate Muslim leaders, nor Jokowi’s assurance of due judicial process for the blasphemy investigation, were enough to calm the increasingly violent protesters. Occupying the front of the State Palace and the Parliament House, violent mobs looted mini markets, burnt parked cars, and threatened to attack the Chinese-majority residential complex where Ahok and his family live. On Saturday morning, as the protesters slowly dispersed and the city’s cleaners cleared away the mess from Friday’s violence, Jakartans were left reflecting upon the gravity of what had happened and what the future holds amidst fears that the next few months of the gubernatorial campaign may be marred by more sectarian and xenophobic violence. The truth is, while it would be easy to simplify the demonstration as an anti-blasphemy or even as an anti-Chinese protest, the political and socio-economic contexts of Friday’s mass mobilisation tell a more complex story. For the FPI as the main motor behind the demonstration, the public outrage following Ahok’s Al-Maidah comment gave them the perfect opportunity for a show of force and intimidation. Ever since taking office – first as Vice-Governor in 2012 and then Governor in 2014 following Jokowi’s ascendance to the Presidency – Ahok has been the only politician brave enough to publicly demand for the disbanding of the small but influential Islamic vigilante group. So far, the FPI has been very successful in appealing to Jakarta’s urban poor. However, for many, much of this has less to do with Islamic piety and more to do with the urban poor’s anger towards Ahok’s aggressive campaign of forced evictions and displacements. Among these largely forgotten urban poor, conspiracy theories of ethnic Chinese developers pulling the strings behind Ahok’s eviction policies have found fertile ground. In this already hostile environment, rumours of Ahok’s alleged insult of the Quran were the final straw. This entire issue must also be seen as part of a greater power play among the higher echelons of Indonesian politics. With the major political parties treating the all-important Jakarta gubernatorial election as an initial battleground in the lead-up to the 2019 Presidential election, an attack towards Jokowi-ally Ahok is also an attack towards Jokowi’s credibility and strength as a leader. Jokowi himself has drawn attention to this fact, stating on early Saturday morning that various ‘political actors’ have opportunistically used the Friday demonstration to achieve their own political ends. Friday’s mass demonstration was the product of long-standing religious, class, ethnic, and political power struggles, packaged together in dangerous hate speech by those who understand the potency of xenophobic rhetoric in Indonesia. It presents the sobering reality that, despite almost two decades of reform, religious and anti-Chinese sentiments still provide convenient rallying points for angry mobs in times of political instability. Ahok has done the right thing by submitting himself to due judicial process to do with the blasphemy accusation. In the future, he would also be wise to show more empathy in listening to the urban poor. On their part, Jokowi and his government need to be much tougher in dealing with racist and religious attacks toward public office holders and in society more generally. This is especially so in the coming months as Jakarta and over 100 other regional areas prepare for simultaneous direct regional elections in February 2017. Almost two decades after post-Suharto reforms began, Chinese Indonesians no longer face the forced assimilation and legislative discrimination they endured under Suharto’s New Order regime. Since 1998, Chinese Indonesian identity politics and culture have flourished, and Chinese organizations, media and Mandarin language education are once again back in the public domain. Scholars term the phenomenon ‘(re)Sinification’ or a ‘return’ to Chinese culture. Politically, Chinese Indonesians now have greater representation and participation than ever before. However, far from being ‘unified,’ their political views and aspirations are extremely diverse. In recent years, motivated by the economic lure of a rising China, closer bilateral ties between China and Indonesia, and a sentimental desire for a return to Chinese modes of identification, many Chinese Indonesians, especially those from the totok (generally understood as ‘unacculturated’ or ‘purer’ Chinese, usually able to speak Mandarin) business community have culturally and linguistically reoriented themselves towards Mainland China, as well as forged closer commercial ties with PRC government and businesses. Within the new climate of Sino-Indonesian cooperation, Chinese Indonesians can potentially play an important cultural and commercial ‘bridging’ role. Nevertheless, considering the violent history of racism against Chinese Indonesians, as well as undercurrents of anti-PRC sentiments in Indonesia, more critical questions need to be asked about the potential dangers of ‘Sinification’ for Indonesia’s ethnic Chinese. Much has been written about Chinese Indonesians since the fall of Suharto in 1998. Since the abolition of the New Order’s forced assimilation policy, Chinese Indonesian identity politics have flourished, prompting scholars and observers to laud the ‘return’ of Chinese culture and identity in Indonesia. Indeed, the dramatic resurgence of Chinese identity politics in Indonesia has been nothing short of remarkable. Where during the New Order, Chinese languages, media, organisations and schools were banned, today, Chinese New Year is celebrated as a national holiday, Chinese cultural expressions can be displayed publicly, Chinese organizations have re-emerged, and the uptake of Mandarin among both Chinese and non-Chinese (pribumi, meaning indigenous) Indonesians has sky-rocketed. Furthermore, when during the New Order, Chinese Indonesians were noticeably absent from politics, today, Chinese Indonesian politicians are present at various levels of government as administrators and elected members of parliament, most notably in the controversial figure of Jakarta Governor Basuki Tjahaja Purnama (Ahok). More recently, there has been a trend of ‘Sinification’ among sections of the Chinese Indonesian community (particularly among the totok business community) whereby, within the context of the rise of China and the burgeoning bilateral relationship between Indonesia and China in the last decade, a growing closeness with China is matched by an increased use of Mandarin and a cultural reorientation towards Mainland Chineseness. Considering the history of anti-Chinese sentiments (both towards the PRC as a state and towards Chinese Indonesians) in Indonesia, it is important to assess how this trend is perceived by pribumi Indonesians, and also by other ethnic Chinese who may oppose an ‘overt’ display of Chineseness and closeness with China. This article provides a critical assessment of the current state of Chinese identity politics in Indonesia. In particular, it examines the potential advantages and disadvantages of a Chinese Indonesian cultural and economic reorientation towards Mainland China. The story of Chinese Indonesians is one that has fascinated scholars and observers for many years. A classic example of what Amy Chua (2004) terms ‘market dominant minority’, since the Dutch colonial era, the ethnic Chinese of Indonesia are commonly perceived as economically strong but politically weak. Furthermore, their inability to lay claim to indigenous modes of belonging in Indonesia meant that Chinese Indonesians have been perpetually viewed as foreigners whose national belonging and loyalty were always in question. This precarious situation made them easy victims of racialized violence during episodes of political or economic instability, the most recent – and notorious – example being the anti-Chinese attacks that occurred during the riots of 13-14 May 1998 in Jakarta, Solo, and a number of other localities. Over the three decades of assimilation under the New Order (from 1966 to 1998), Chinese Indonesian culture and identity were in many ways ‘erased’ or at least hidden from public view, although their forced assimilation also had the paradoxical effect of accentuating the group’s essential foreignness in the national imagination (Coppel, 1983; Hoon, 2008; Suryadinata, 1978). As has been widely noted, the situation changed dramatically for Chinese Indonesians after the fall of the New Order regime in May 1998 that followed months of economic and political instability, widespread riots and anti-Chinese attacks (Purdey, 2006). In the aftermath of the May 1998 riots, the successive post-Suharto Indonesian governments quickly attempted to ‘remedy’ the situation by abolishing the New Order’s assimilation policy. This new policy of tolerance towards the ethnic Chinese heralded a new era of ‘re-Sinification’ that saw a dramatic revival of Chinese socio-political organisations, languages and media. Almost overnight, the number of Chinese Indonesian organizations multiplied so much that by 2007, there were at least an estimated 176 Chinese voluntary associations across Indonesia, the majority being clan associations that were dormant throughout the New Order (Dawis, 2010). Many of the larger ‘umbrella’ organizations such as the Chinese Indonesian Association (Perhimpunan Indonesia Tionghoa or INTI) and the Indonesian Chinese Social Organization (Paguyuban Sosial Marga Tionghoa Indonesia or PSMTI) were new and part of a concerted effort by Chinese Indonesian leaders and activists to ensure greater socio-political representation for ethnic Chinese. A number of these associations have had success advocating for recognition of Chinese Indonesian rights. For example, INTI, together with the now defunct Chinese Indonesian Political Party (Partai Tionghoa Indonesia or PARTI), and the Anti-Discrimination Movement (Gerakan Anti Diskriminasi or GANDI) were instrumental in the instalment of new Citizenship Law No. 12/2006 that recognizes all Indonesian-born ethnic Chinese as Indonesian citizens. Furthermore, partly due to long-time lobbying by INTI, in 2014, President Susilo Bambang Yudhoyono changed the term ‘Cina’ (considered derogatory by many ethnic Chinese) to the much more acceptable term ‘Tionghoa’ for use in public discourses. On the cultural front, PSMTI successfully established the Chinese Indonesian exhibit (Taman Budaya Tionghoa) at Taman Mini Indonesia Indah (Mini Indonesia Park), while the Supreme Council for Confucian Religion in Indonesia (Majelis Tinggi Agama Konghucu Indonesia or MATAKIN) was successful in pushing for the recognition of Chinese New Year as a religious Confucian national holiday in Indonesia. In the political arena, where they were once weak, a growing number of Chinese Indonesians have participated in local and national legislative elections. There were 100 ethnic Chinese candidates in the 2004 elections, 213 in the 2009 elections, and 315 candidates in the 2014 elections. Presently, 18 elected members of the national parliament are ethnic Chinese from various political parties (notably, 14 MPs are from PDI-P). As mentioned before, the most popular and controversial Chinese Indonesian politician is current Jakarta Governor Basuki Tjahaja Purnama (Ahok). Formerly Regent of East Belitung Regency in the Bangka-Belitung Province, and also a former member of parliament for Golkar, Ahok rose to national prominence when he became the running-mate of Joko Widodo (Jokowi) in the 2012 Jakarta gubernatorial race. Succeeding as Governor when Jokowi became President in 2014, Ahok has been a constant fixture in national politics ever since. Outspoken, keen to enforce his own reform agenda, and with a brash public persona, Ahok is a divisive figure, both among the general public and among Chinese Indonesians. While many applaud Ahok’s bold policies, which include the building of Jakarta’s long-awaited underground metro system and the (forced) relocation of thousands of poor slum residents along Jakarta’s filthy river banks, others are wary of his take-no-prisoners attitude. Many Chinese Indonesians in particular are worried that negative perceptions of Ahok will reflect badly on all Chinese in general. Another important issue that has created rifts among Chinese Indonesians is the trend of overt Sinification and closeness to China (Hoon, 2006; Setijadi, 2015). It is easy to understand why many Chinese Indonesians embraced Chinese culture and chose to orient themselves towards Mainland China in the post-Suharto era. In terms of affect, after decades of forced assimilation and feeling like they do not belong in Indonesia, many find comfort and belonging in once again expressing themselves as ‘Chinese.’ This is especially the case with older totok Chinese Indonesians (pre-1965 generation), most of whom experienced Chinese education and felt deeply embittered by the ‘erasure’ of Chinese identity and culture during the New Order (Sai, 2010). For these ethnic Chinese, the rise of China as a global power rouses a sense of ethnic pride and legitimation. From a much more practical perspective, the rise of China presents an unprecedented opportunity for Chinese Indonesians to act as intermediaries in (mainly commercial) dealings between Indonesia and China. A central assumption here is that a shared Chinese ethnicity, along with the ability to speak Mandarin will give ethnic Chinese persons an advantage in forging guanxi (kin/network-based preferential relationship) with business counterparts in Mainland China or other Chinese communities worldwide. For younger Chinese Indonesians, the desire to keep up and ride on the wave of China’s rise is the main motivation for learning Mandarin and maintaining an active interest in developments in Mainland China. Indeed, this is a major factor why, over the last two decades, we have seen a sharp rise in the uptake of Mandarin language learning among the worldwide ethnic Chinese population, and China is fast becoming one of the top destinations for higher education for international students alongside traditional receiving countries such as the US, UK and Australia (Setijadi, 2013). At the same time, the bilateral relationship between China and Indonesia has blossomed over the last fifteen years. This is evident in the establishment of the Sino-Indonesian strategic partnership in 2005, and the recent signing of Memoranda of Understanding (MoU) between the two countries for further Chinese foreign direct investment in Indonesia as part of the One Belt One Road and the 21st Century Maritime Silk Road Economic Belt (popularly known as ‘New Maritime Silk Road’) visions announced as part of Chinese President Xi Jinping’s ambitious expansion plans. The fact that Xi Jinping announced this New Maritime Silk Road plan during his state visit to Jakarta in October 2013 is a reflection of how important Indonesia is to China’s long-term strategy in the Asian region. According to data from the Trade Ministry, Indonesia had a US$10 billion trade deficit with China in 2015. Chinese investment is very important, particularly for the building of infrastructure and maritime projects desperately needed to fulfil President Jokowi’s vision of Indonesia as a global ‘maritime fulcrum’. This is quite a remarkable development, especially if we remember the diplomatic freeze between China and Indonesia from 1967 to 1990 following allegations of China’s involvement in the alleged abortive communist coup of 30 September 1965 which sparked strong anti-communist and anti-China discourses in Indonesia. Today, the potential for Chinese Indonesians to act as trade, cultural and linguistic intermediaries is well understood, not just by Chinese Indonesians themselves but also by both the PRC and Indonesian governments. Historically, appealing to, and garnering support from, ethnic Chinese communities and diaspora abroad has been an important part of the Chinese state’s foreign policy. Since 1989, China has actively pursued policies to connect and harness overseas Chinese’s economic and political potential by using tools that include overseas recruitment, investment incentive programmes, and government entities such as the Overseas Chinese Affairs Committee of the National People’s Congress (OCAC) and the Overseas Chinese Affairs Office of the State Council of the People’s Republic of China (OCAO) that deal specifically with overseas Chinese populations. Furthermore, Beijing has attempted to exert strategic influence on Chinese communities worldwide through soft-power inducements like scholarships, ‘ancestral village’ tourism, sponsorship of ethnic Chinese cultural events, and the sending of volunteer Mandarin language teachers abroad through government institutions such as the Confucius Institutes worldwide. The result has been the growing importance of overseas Chinese as a significant economic and political force for China (Liu, 2011). The implications for both multi-generational ethnic Chinese who have acculturated into their host countries or new migrant Chinese nationals living abroad are significant but not well understood. Chinese Indonesians as a ‘bridge’? Thus far, Chinese Indonesian organisations and prominent individuals have been actively involved in trade and cultural exchanges between Indonesia and China. Socio-cultural Chinese Indonesian organizations such as INTI and PSMTI as well as smaller clan and religious organizations hold regular cultural and philanthropic events (particularly around the time of Chinese New Year) that are often done in cooperation with the Chinese embassy in Jakarta, or at least attended by embassy officials. In commerce, Chinese Indonesian entrepreneurs and businesses are instrumental players in Sino-Indonesian trade relations, particularly in forging business-to-business (B2B) relations. Realizing the importance of personal connections and referrals in conducting business with China, many Chinese Indonesian entrepreneurs join associations such as Chinese Indonesian Entrepreneur Association (Perhimpunan Pengusaha Tionghoa Indonesia or PERPIT), Indonesian Chinese Entrepreneur Community (Perkumpulan Masyarakat dan Pengusaha Tionghoa Indonesia or PERMIT), and Indonesia-China Business Council (ICBC) in order to gain access to these associations’ networks with current and potential Chinese investors and/or business partners. Indeed, these associations and their members often act as the first point of contact for Chinese businesses and trade delegations when they look for business and investment opportunities in Indonesia. Because of this, they are careful to maintain cordial relations with the PRC Embassy and Consulates in Indonesia, as well as with officials from the relevant state institutions in China. Many of the executive members and elders of these associations are (older) established ethnic Chinese business tycoons with strong business connections such as Dato Sri Tahir and Kiki Barki. These tycoons are usually also elders in larger organizations such as INTI, as well as in clan and region-based groups, which means that they are influential players in both Chinese Indonesian identity politics and Sino-Indonesian relations. Outside of organised groups, it is well known that most, if not all, prominent Chinese Indonesian business tycoons have commercial links and investments in China. In the last few years, these Chinese Indonesian entrepreneur associations have been connecting more with the global network of overseas Chinese entrepreneurs, so much so that in September 2015, PERPIT hosted the World Chinese Entrepreneurs Conference (WCEC) in Bali. Bringing the WCEC gathering to Indonesia is a big feat for PERPIT, not only because it promotes investments and trade in Indonesia, but also because it demonstrates that Chinese Indonesian business leaders are prominent and influential in the global overseas Chinese business scene. It can be seen from these developments that the totok Chinese business community is certainly actively creating a strategic ‘bridging’ role for themselves in Sino-Indonesian relations, at least in the commercial sector. Amidst all these developments however, many within the Chinese Indonesian community are getting increasingly worried about the growing confidence of the totok business elite in displaying their Chineseness and closeness with China. This is especially true among peranakan Chinese, the vast majority of whom do not speak Mandarin or other Chinese languages. Language is a major issue here, where non-Mandarin speaking Chinese Indonesians are uncomfortable with the fact that some Chinese Indonesian public events are now done bilingually in Indonesian and Mandarin. Keeping in mind that the majority of ethnic Chinese in Indonesia originally spoke Hokkien, Hakka or Teochew, the growing dominance of Mandarin reflects the general trend that – like in other Chinese communities around the world – many Chinese Indonesians are orientating themselves more to a Mainland Chinese version of Chineseness. Perhaps more importantly, there are worries about a potential backlash to ‘overt’ public displays of Chinese culture, the use of Mandarin, and closeness to China. The fact that such worries exist indicates that there are still negative ideological connotations in post-Suharto Indonesia about China and the loyalty of Chinese Indonesians. Indeed, even now, there are frequent attacks in the media by various right-wing and Islamist pribumi groups that accuse Chinese Indonesian businessmen and politicians of being China’s puppets in Indonesia. Attacks on Jakarta Governor Ahok are often based on his Chinese ethnicity, and even Jokowi was accused of being Chinese in a smear campaign during the 2014 Presidential race. Furthermore, while most can agree that good trade relations between China and Indonesia are needed, the Jokowi administration’s seeming closeness to China is starting to draw widespread criticisms. One case in point is the on-going controversy surrounding the multi-billion dollar tender for the Jakarta-Bandung high-speed rail project that was – after a confusing backflip by the Indonesian government – eventually awarded to China instead of Japan in October 2015. The opaque handling of the tender process aroused suspicions that Jokowi’s administration – particularly Minister of State-Owned Businesses Rini Soemarno – is strongly biased towards, and acting for the interests of, Chinese businesses. Additionally, criticisms surrounding the awarding of power plant-building contracts to a Chinese consortium, and panic over the supposed ‘flood’ of Chinese labourers into Indonesia to work on infrastructure and manufacturing projects also reflect persisting suspicions over China’s influence in Indonesia. While anti-China discourses do not necessarily cause, or go hand-in-hand with, negative perceptions of Chinese Indonesians, history has shown that – for better or worse – perceptions of China in Indonesia has inevitably affected Chinese Indonesians. In the meantime, for Chinese Indonesians who are worried that an overt display of Chineseness might perpetuate negative stereotypes of foreignness and disloyalty, the fear of a pribumi ‘backlash’ is real. Clearly, the trend towards Sinification and closer ties with China has created gaps among Chinese Indonesians – between the totok and peranakan groups, Mandarin and non-Mandarin speakers, the business elite and others, and the older and younger generations. If at the beginning of the post-Suharto era, Chinese Indonesian organizations played a much greater advocacy role that represented most, if not all, Chinese Indonesians, nowadays they are dominated by business elites who possess both the capital and influence to put forward their own cultural and commercial agendas. Those outside of this exclusive group have expressed discontent over the direction of Chinese Indonesian identity politics, and these internal divisions may widen even further in the future. Post-Suharto Chinese Indonesian identity politics has evolved over the last two decades, and will continue to adapt to changing socio-political climates that have to do with both domestic politics and the rise of China in the region. For Chinese Indonesians, the challenge is to find a balance between freedom of expression, capitalising on their ‘bridging’ role in Sino-Indonesian relations, and managing their public image in a country that is ultimately still suspicious of their loyalty. The distinction between totok and peranakan (generally understood as non-Chinese speaking, ‘acculturated’ Chinese with mixed ancestry and their own distinct culture) Chinese Indonesians is complex. Furthermore, largely because of assimilation under the New Order, the traditional boundaries between totok and peranakan have become blurred. However, for the sake of simplicity, throughout this article, the terms ‘totok’ and ‘peranakan’ are used to distinguish between Chinese Indonesians who can and cannot speak Chinese, and between those who are more and less oriented towards Chinese culture respectively. http://asiapacific.anu.edu.au/newmandala/2014/07/04/striving-for-safety/ (accessed 29 February 2016). http://www.wsj.com/articles/SB10001424052702303722604579112940343117368 (accessed 29 February 2016); http://www.bsd-kadin.org/news/news-detail/id/86 (accessed 29 February 2016). http://www.thejakartapost.com/news/2015/11/20/indonesia-eyeing-more-investment-china.html (accessed 29 February 2016); http://thediplomat.com/2015/03/indonesia-china-seal-maritime-partnership/ (accessed 29 February 2016). http://www.fmprc.gov.cn/mfa_eng/topics_665678/xjpfwynmlxycx21apec_665682/t1085195.shtml (accessed 1 March 2016). http://www.straitstimes.com/opinion/why-have-two-world-chinese-entrepreneur-conferences (accessed 1 March 2016). https://www.nahimunkar.com/kelakuan-orang-cina-indonesia-anda-mau-tahu/ (accessed 1 March 2016). http://www.beritateratas.com/2016/01/ahok-cina-kafir-ahok-galak-tukang-gusur.html; http://asiapacific.anu.edu.au/newmandala/2014/07/04/striving-for-safety/ (accessed 1 March 2016). http://www.abc.net.au/news/2015-09-30/indonesia-awards-major-rail-contract-to-china/6818082; http://www.wsj.com/articles/indonesia-to-break-ground-on-first-high-speed-railway-this-year-1443596942?mod=rss_Business (accessed 1 March 2016). http://bisnis.liputan6.com/read/2339420/di-kabinet-kerja-menteri-rini-dikenal-paling-dekat-dengan-china; http://finance.detik.com/read/2015/09/17/073448/3021034/5/rini-soemarno-antar-3-bank-bumn-teken-utang-china-rp-42-triliun (accessed 1 March 2016). http://en.tempo.co/read/news/2016/01/13/241735595/Sofyan-Basir-PLN-CEO-Chinese-investors-today-are-different (accessed 1 March 2016); https://m.tempo.co/read/news/2015/08/31/173696600/jk-minta-menteri-tenaga-kerja-cegah-banjir-buruh-cina (accessed 15 January 2016). If throughout the New Order, Chinese Indonesians were mostly absent from politics, post-Suharto ethnic Chinese are slowly getting over their political trauma and becoming much more vocal. But whom will they vote for and what is at stake for Chinese Indonesians in the upcoming presidential elections? The ethnic Chinese may only comprise around 1.2% of the Indonesians population (according to the 2010 population census although the actual figure is likely to be much higher), but given their problematic history and socio-economic significance, who they vote for and the reasons behind that choice provide an indication of the kinds of issues that still exist in the country’s racial and minority politics. While the Jokowi vs Prabowo divide is nation-wide, the issue of whom to vote for this time is particularly important for the ethnic Chinese, not least because of the Prabowo factor. Without a doubt, the most hotly debated election issue for Chinese Indonesians is the on-going uncertainty about Prabowo’s role in the May 1998 riots that affected so many Chinese in Jakarta, Solo, Medan and other cities. Throughout the campaign season, I’ve had many similar conversations with ethnic Chinese from all walks of life in Jakarta, Medan, Bandung and other cities. Prabowo’s refusal to clarify his role in the May ’98 riots have lead to assumptions about his guilt, and many Chinese simply do not trust him. Chatting over cups of tea at a small coffee stall in Medan, my elderly Chinese companion Pak Didi showed me a video on his phone of a speech that Prabowo had made in 2004 to members of Pemuda Panca Marga (Clan Association Youth, a pro-military organisation for the children of Indonesian army veterans). Adding fuel to the fire, support for Prabowo by paramilitary groups such as Pemuda Pancasila (Pancasila Youth) and the Islamic Defenders’ Front (FPI) raised concerns that a Prabowo presidency would give these groups more confidence to terrorise minority groups like the Chinese. These fears are compounded by recent reports of intimidation by the Prabowo camp, such as recent claims that Village Supervisory Non-Commissioned Officers (Babinsa) had been going door-to-door in residential areas with large ethnic Chinese populations. To his ethnic Chinese supporters, Jokowi represents hope that Indonesia would not go back to New Order-style oppression. Jokowi’s down-to-earth mannerisms appeal to those who fear a return to autocracy and militarism. Furthermore, Jokowi’s impartial stance on issues of race and religion during his time as Solo Mayor and Jakarta Governor – such as in his insistence on installing Susan Jasmine Zulkifli, a Christian woman, as Sub-district Head (Lurah) in a Muslim-majority area despite FPI opposition – is seen as an encouraging sign of his commitment to pluralism. However, an equally important issue for the ethnic Chinese is safety. For Chinese Indonesians still traumatised by past anti-Chinese discrimination and violence, choosing the next president is not only about assessing the candidates’ background or history; it is also about voting for the individual perceived most able to ensure the safety of Chinese Indonesians. To many ethnic Chinese, the man considered as ‘stronger’ and better equipped to bring law and order to the country is Prabowo. Prabowo defenders also dismiss rumours of Prabowo’s anti-Chinese sentiment by saying that it was Prabowo who supported Basuki Tjahaja Purnama’s (Ahok) candidature as Vice-Governor of Jakarta and point to Ahok’s prominent position in Gerindra. As can be expected, there are frequent passionate debates between ethnic Chinese supporters of Jokowi and Prabowo. Those who support Jokowi accuse Prabowo supporters of historical amnesia, while Prabowo supporters contend that Jokowi fans only think with their hearts and not with their heads. 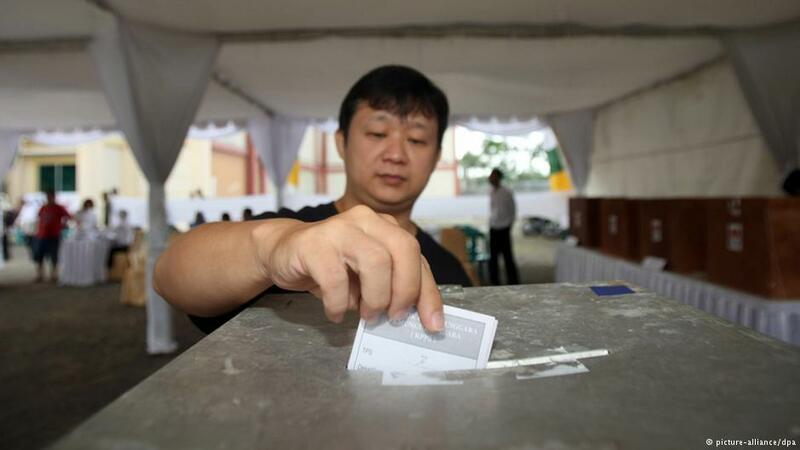 However, while many Chinese Indonesians have made their choice, there are also many who are still undecided. Both the Jokowi and Prabowo camps seem to understand the importance of appealing to ethnic Chinese communities, if not to garner physical votes or financial support, then for the public relations boost aimed at demonstrating the candidates’ multicultural and human rights credentials. During separate ‘meet and greet’ events with the Chinese Indonesian Association (INTI) I attended in June, both Jokowi and Prabowo did their best to assure the mostly ethnic Chinese audience of their safety and continued wellbeing in Indonesia. Prabowo nostalgically recounted his old friendships with ethnic Chinese friends and even told stories of his fondness for ancient Chinese folklore. Unsurprisingly, both candidates whipped out the ‘Ahok card.’ Jokowi cited his successful partnership with Ahok in Jakarta as proof of his ability to work harmoniously with an ethnic Chinese. Prabowo claimed that he had put himself on the line to guarantee Ahok’s candidature as Jakarta Vice-Governor in 2012. Nevertheless, while both Jokowi and Prabowo try to appeal to ethnic Chinese voters, they have to at the same time be careful not to look too Chinese-friendly. Anti-Chinese sentiment in Indonesia is still very much alive, despite over fifteen years of reformasi. Recent ‘black’ campaign in social media and publications by hard-line Muslim and anti-Jokowi groups such as Tabloid Obor Rakyat accused Jokowi of not only being a Christian, but also an ethnic Chinese. Very quickly, Jokowi supporters came to his defence and refuted these accusations. However, the very fact that Jokowi supporters felt the need to ‘defend’ Jokowi from accusations of being Chinese (and Christian) is in itself a very sad indication of the state of plural society in Indonesia. It is impossible to accurately predict which direction the ethnic Chinese vote will sway. My observations suggest that most ethnic Chinese in urban areas are pro-Jokowi, but as is the case elsewhere in Indonesia, it will be a close call in Chinese communities too. Chinese Indonesians are heterogeneous, and there is no such thing as a unified Chinese vote. One thing for sure is that many Chinese Indonesians will vote for a candidate that can make them feel safe in a country that they love but has so often turned against them. As the presidential race enters its last days, both Jokowi and Prabowo must convince ethnic Chinese voters of their firm commitment to uphold the law and minority rights.